Finding the best cajon for you can be tricky with all of the models available. I’ll show my top picks for the best cajon in a variety of categories. I actually only recently fell in love with the cajon after seeing an amazing performance using one on YouTube (I’ll link to it down in the article). I instantly realized what an amazingly powerful and versatile instrument it is for being so simple and I decided to do some research to find the best cajon out there. It turns out that there are many styles and customizations available (even an electronic cajon! ), so I’ll go over some of the best options I found down below. You probably won’t find a cajon this cheap that produces better sounds, and that’s why the Meinl Compact Jam Cajon takes my top spot for best cajon for beginners. It’s compact size and lightweight construction make it great for taking on-the-go, and the dual internal snares deliver a nice sensitive response. The corners on the front plate can be easily adjusted with a screwdriver to shorten or lengthen the distance between the front plate and body. This allows for a large variety of tones for a deeper or more shallow backbeat. It measure 10.25" wide x 15" tall x 10.25" deep which isn’t very small, but it’s a little bit smaller than your average cajon. 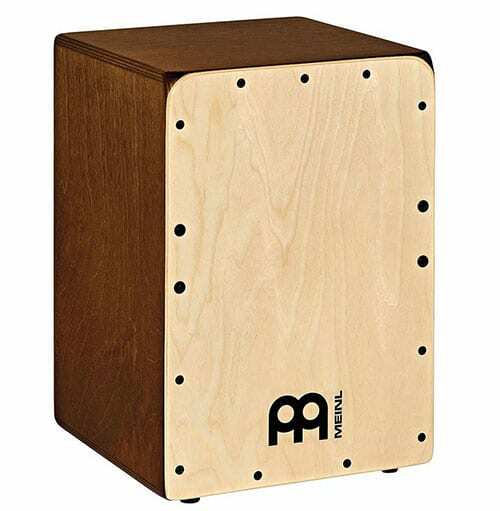 The smaller height makes this a great choice for the smaller players out there and it also makes this the best cajon for kids. If you are on the taller side (taller than 6 feet), you might want to consider one of the other options down below since you might end up with back problems from the smaller size. Pyle did a great job here. 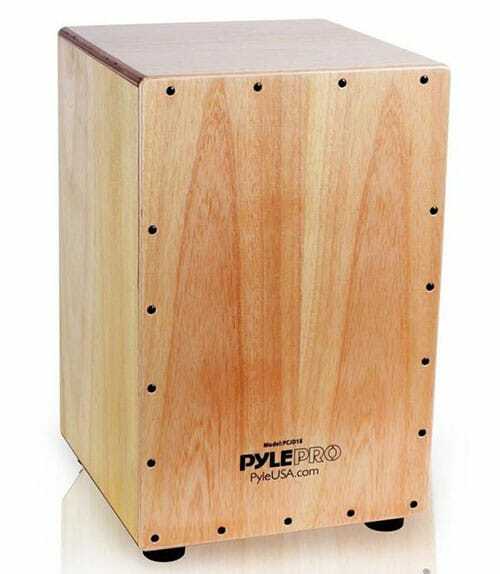 This handcrafted birch wood cajon stands out from the others in this price range for it’s robust sound. The snare wire tension can be adjusted on the bottom of the unit via 2 hex screws, and using the included hex key is very simple and quick. One feature of love is that it comes with sturdy rubber feet. Not only does this provide a non-slip foundation, but it soaks up any unwanted vibration that would otherwise be channeled into the floor. The result is a very refined and clear sound. At 18” high and 12” wide it’s a bit bigger than the previously mentioned Meinl Compact Jam Cajon, but it’s still lightweight and because of the bigger size you’ll get a deeper tone which is a big plus. For these huge benefits and the low cost I’m naming this the best cajon for the money. In my sudden interest in finding the best cajon, I’ve gone out and played on a LOT of different ones and sometimes the differences are very dramatic. 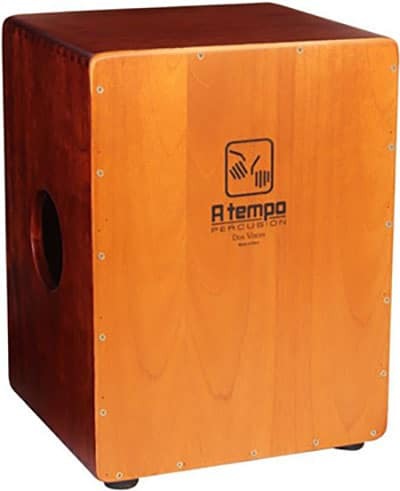 Made by Sol Percussion, the A Tempo Percussion Dos Voces (Two Voices) Cajon is the best sounding one I have found. Though it’s a little more expensive than the others on this list I feel that it’s worth every penny especially when you throw in the fact that it has 2 different playing surfaces due to the sound hold being on the side instead of the back. One of the sides has no snare, so it produces a mellow, smooth, and bassy sound that is great for soft music or acoustic sets. This is more of a traditional Peruvian sound. Flip over to the other side and you’ll get the full aggressive bite and attack from the snares. This is perfect for louder playing situations or in flamenco music. The bass here is pretty clean for the most part, so if you are looking for a very raspy sounding bass tone it’s best to look elsewhere. I found that the clean bass allows for a much more unique sound compared to other cajon’s and it sounds great. This cajon is handmade in Peru and the body is made from solid, furniture-grade panels of Mohena, with dovetail joints and a beautiful finish. Roland, one of the leading manufacturers of electronic drum sets, have created something very unique and interesting here. 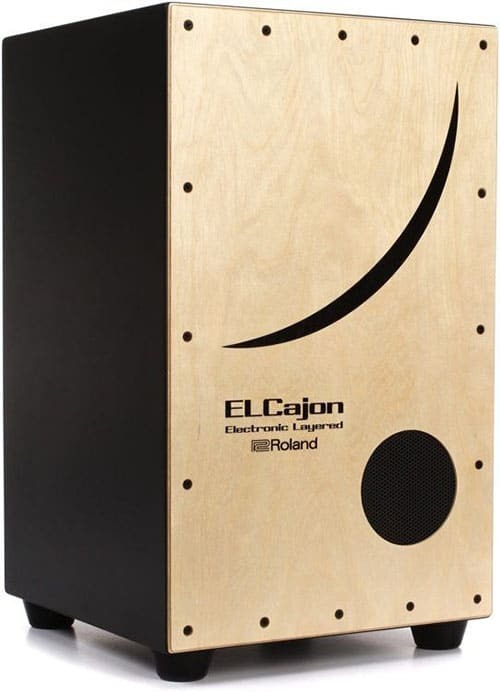 It’s both an electronic and an acoustic cajon in one package, so you get the flexibility of both worlds. The front plate is made of a nice sapele wood. It allows for a nice snap on the high and and a nice boomy low end. What makes this instrument so unique is that it has electronics built-in, so you can combine the acoustic sound with the electronic sounds and have a lot of fun. With the electronic portion of this you get a built-in speaker and 30 electronic kits to switch between and combine with the acoustic sound. It features 10 cajon sounds, 10 percussion sounds, and 10 sound effects presets. Most presets here are very subtle and are only meant to slightly enhance the raw acoustic cajon sound, but there are a few that allow you to really go crazy with the sounds. One nice feature here is a sensitivity dial so you can customize how hard you need to play in order to trigger the electronic sound. The back of the cajon features a volume knob, power switch, an audio-out port, and even a 1/8th inch mix-in port for jamming along with an external audio source. The last knob on the back is the trigger-balance knob. This is a really great feature that allows you to specify if you only want the electronic sound to trigger on the top section of the striking surface for mixing in different snare sounds, only in the middle for mixing in electronic bass tones, or on both. This way you can get the perfect mix of electronic and acoustic sounds that’s perfect for you. While the speaker on the front is great, the EC-10 really shines when you plug it into an external speaker or PA system. Overall it’s a very lightweight cajon coming in at around 9 pounds, it’s battery operated (lasts for up to 12 hours), or you can choose to plug it in if you want. With such a small footprint and cheap price this is a cajon everybody should have around. In addition, it makes a great gift for drummers. Because of the small height (roughly 8 inches high), you don’t sit on this like a traditional cajon. It’s really great for practicing technique or for jamming out while laying down on the couch in front of the TV. It’s made of baltic birch and features a very thin front plate for a super-responsive sound. Because of the great sound, cheap price, and the fact that you can stick this in your backpack and take on the go, the Meinl Mini Cajon gets my vote for best budget cajon. Many modern instruments are cumbersome and most require some kind of stand or stool. 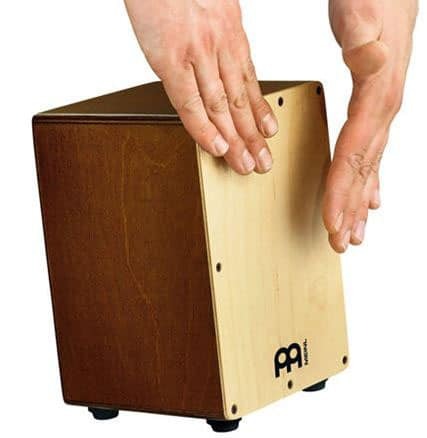 The cajon is a simple percussion instrument that is a drum, stand, and a seat all in one convenient portable package. The history of the cajon starts in West Africa where indigenous people had a rich culture surrounded by music. Many were captured and brought to America as slaves in the 18th century, but without their instruments and with laws prohibiting them from playing music, life was hard. Luckily, African slaves in coastal Peru had a lot of shipping crates around that they could secretly drum on. This eventually evolved into the first cajon which was a box with 5 sides made of thick wood, and the 6th side made of thin wood (the striking side called the tapa). A hole was then cut in the back side to allow sound to escape. As Afro-Peruvian culture evolved, so did music and dance. The cajon became a widely used staple in this style of music. Some early modifications started with bending the planks of the box to achieve different sounds. After slavery was abolished, the cajon was introduced to the rest of the world and more experimentation followed. Paco de Lucía was a famous Spanish flamenco guitarist who introduced the cajon to Europe. After traveling with his band to Peru, he saw the enormous benefits of the cajon in flamenco music and brought it back with him to Spain. By stretching guitar strings along the inside of the tapa, they were able to achieve a buzz-like snare sound when striking the front. Combined with the regular bass tone, this gave the cajon a sound close to a basic drum set. After this, popularity of the cajon exploded and it found its way into folk, blues, jazz, and rock. Today you can find all types of custom cajon’s. Some have multiple striking surfaces, adjustable snares, and there are even electronic cajon’s being developed. How Do You Play A Cajon? There are numerous ways to play the cajon, and the limit really is your own imagination. The most common way to play the cajon is to sit on it and slap your hands and fingers against the front side. 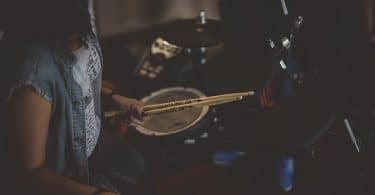 There are 3 main types of strokes when doing this: striking closer to the center for a bass tone (emulating a bass drum), striking a little higher for a more mid-pitched tone, and striking near the very top for the most high pitched sound (like a snare drum). Utilizing a variety of these strokes in a groove will lead to more interesting playing. Some percussionists attach a bass drum pedal to the cajon allowing them to play with a foot as well. 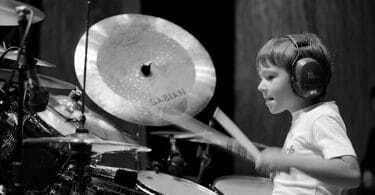 It’s also been seen being played with plastic and metal brushes that are commonly used on drum sets. Tuning a cajon is very simple as long as you know what you are doing and don’t go too far with tightening. In order to change the pitch of the cajon, simply use a screwdriver to loosen or tighten all the screws on the top half of the front face. You want to turn all of the screws the same amount - usually no more than a quarter turn - so that you can an even sound. The tighter you go the higher the pitch will be, and the looser you go the lower the pitch will be. Just be careful here not to overtighten the screws. If you go too far you may end up damaging the instrument and it will be very difficult to get it sounding good again. The next thing you can do is adjust the snare wires. To do this you’ll want to use a hex key to tighten or loosen the hex nuts on the bottom of the unit. The tighter you go the more stiff and tight the snare wires will be which leads to very little rattle. This is more of a traditional Peruvian sound and is great for softer styles of music. The bass will be almost completely clean and you’ll still get a tiny bit of quick buzz in the upper corners. The looser you go the more the snares will rattle against the front surface. You’ll get a lively sound here all over. This is ideal for louder styles of music. Just like the front screws, be sure not to overtighten the hex nuts as it might overstretch the snare wires and damage them.